In recent years, the movement to increases minimum wage has been active in states across the country. Advocates of these wage hikes argue that the increases will help low-income families escape poverty. While this argument is emotionally compelling, it ignores the unintended consequences that the proposed increase would create—such as job loss among the most vulnerable employees and displacement of low-skilled adults by wealthy teens. Even worse, the mandated increase overwhelmingly confers its benefits on employees who are not poor, while those who are bear a disproportionate share of the costs. 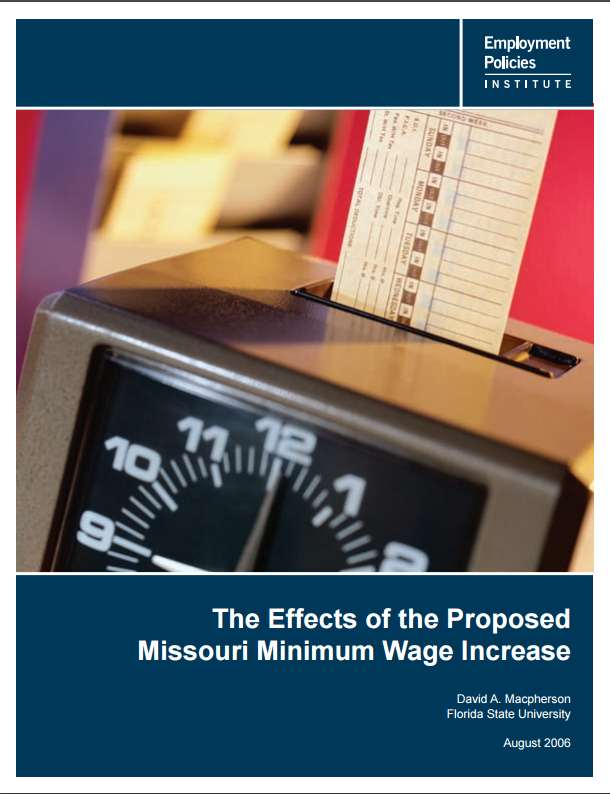 This paper by economist Dr. David Macpherson from Florida State University analyzes the proposed initiative to increase the minimum wage in Missouri. By using Current Population Survey data and labor demand estimates (as reported by a consensus of economists), this research shows that the proposed increase will be an expensive mandate on the employers—and citizens—of Missouri. Even more troubling, this enormous expense will do little to increase the quality of life for the state’s poor—and it will greatly worsen conditions for those who lose their jobs following the increase. Employees who will be affected by the Missouri proposal will be younger and less educated than the average Missouri employee. The majority (86.3%) will be teens who are living with their parents or relatives, single earners without children, or dual earners. This explains why the average family income of an affected employee is $46,167. The poor targeting of this proposal is clear in the distribution of benefits that are anticipated from the increase. About four-fifths of the benefits will go to families above the poverty line, with 30% of the benefits going to families with annual incomes of over $60,000. Unfortunately, it is the families that are living in poverty that will bear the brunt of the attendant job loss, with almost 30% of the job loss accruing to families with annual incomes of less than $25,000. The least skilled members in the workforce will also suffer disproportionately, bearing over 45% of the total job loss. Meanwhile, employers would see labor costs rise $44 .4 million a year. Overall, the minimum wage increase is projected to cause 1,552 employees to lose their jobs, with one-third of the job losses occurring in the leisure and hospitality industries. This job loss would cause the affected employees to suffer from an annual income loss of $15 .1 million. The findings reported in this paper, and the calculation of the enormous economic cost of a mandated wage increase, ought to caution voters against supporting a minimum wage increase, especially since the proposed wage increase would confer most of its benefits on families that are not poor and impose a disproportionate share of its costs on those who are poor.